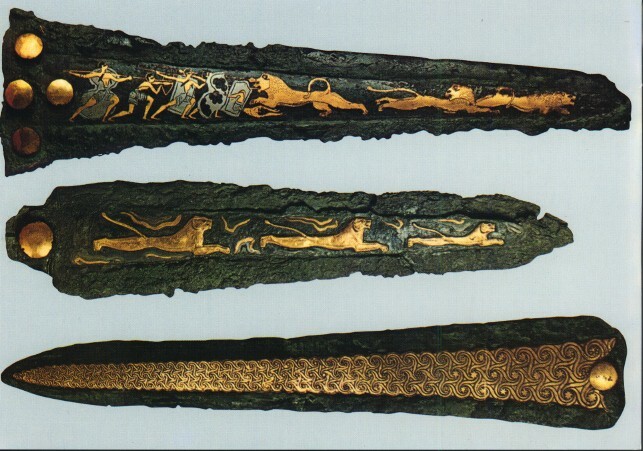 This Bronze Age dagger is from the Mycenaean civilization, c. 1500 BC. This doesn't mean it belonged to Him, by the way. It's not like He put His name on it so Peter wouldn't keep borrowing it to mix up his shaving soap. (In any event, it was found in the underwater ruins of ancient Alexandria.) It is interesting if it's an early non-Biblical reference from so far away. The dating seems to be an issue, though, as the engraving was "made on the thin-walled ceramic bowl after it was fired, since slip was removed during the process." The article doesn't explain whether the engraving itself can be dated independently of the artifact. 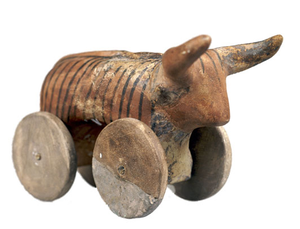 This whimsical creature comes from a Neolithic European culture called the Cucuteni-Trypillian and evidently went zoom-zoom just like a modern pull toy. It's part of an exhibition at the Vatican's Palazzo della Cancelleria. Article and slide show at Discovery. Archaeologists have discovered a 19-metre (62-foot) Buddha statue along with scores of other historical relics in central Afghanistan near the ruins of giant statues destroyed by the Islamist Taliban. The team was searching for a giant sleeping Buddha believed to have been seen by a Chinese pilgrim centuries ago when it came upon the relics in the central province of Bamiyan an official said on Monday. "In total, 89 relics such as coins, ceramics and a 19 meters statue have been unearthed," Mohammad Zia Afshar adviser in the information and culture ministry, told Reuters. He said the idol, in sleeping posture, was badly damaged. The other relics dated back to the Bacterian era and from Islamic and Buddhist civilizations. . . .The shape of the molars suggests the mouse came from the northern Levantine coast, as they are similar to those of modern house mice in Syria, near Cyprus. Most of these individuals had sustained multiple perimortem (around the time of death) injuries from a variety of projectiles and hand-held weapons, many of which bear resemblance to those curated by the National Armouries Museum, Leeds (collaborators on the project), and dating to the late Medieval period. . . . Many of the individuals suffered multiple injuries that are far in excess of those necessary to cause disability and death. From the distribution of cuts, chops, incisions, and punctures, it appears that blows cluster in the craniofacial area, in some cases bisecting the face and cranial vault of some individuals and detaching bone in others. Series of cuts and incisions found in the vicinity of the nasal and aural areas appear to have been directed toward removal of the nose and ears. There are few infra-cranial (torso and limb) injuries, which may suggest that these areas were not targeted, that these individuals were wearing armour, or that they sustained their injuries while in a position that did not allow them to defend themselves. The pattern, distribution, and number of these insults argues for perimortem mutilation. Many were left in a state that would have made identification difficult, even more so as they had been stripped of identifiable weapons and clothing prior to interment (a normal practice in the Medieval period). Via Cronaca. The illustration is from the Wikipedia entry for the Battle of Towton -- the white rose is York, the red Lancaster. The remote Amazon river basin was once home to densely populated towns and villages, Science journal reports. This part of the Amazon, once thought to be virgin forest, has in fact been touched by extensive human activity. Researchers found traces of a grid-like pattern of settlements connected by road networks and arranged around large central plazas. There is also evidence of farming and wetland management, including possible remains of fish farms. The settlements are now almost completely overgrown by rainforest. Parts of a giant, exquisitely carved marble sculpture depicting the Roman emperor Marcus Aurelius have been found at an archaeological site in Turkey.
. . . The colossal head, which is just under 1m (3ft) in height, is said to bear his characteristic bulging eyes and beard. Although I would characterize the beard as more "curly" than "bulging."